Atlanta's Barbara Ladin Fisher, Lynette Joel, Miriam Karp, Shoshanna Rosenthal and Flora Rosefsky have work on display. Five Atlanta-area residents are among 28 Jewish artists whose work is on display through May 10 at the Marcus JCC’s Katz Family Mainstreet Gallery. The juried exhibit, “A Journey Through Time: Works of the American Guild of Judaic Art,” includes paintings, weavings, quilts, sculpture, jewelry and photography. The exhibit, which opened Feb. 23, coincides with Jewish Arts Month, which the guild sponsors each March to encourage synagogues, community centers, libraries and schools to showcase Jewish art. Jewish Arts Month is timed with the reading of Parshat Vayakhel, which introduces the Jewish artisan Bezalel with descriptions of his designs for the Mishkan in Exodus 35:1 to 38:20. That reading fell on March 10 this year. “Jewish art is a true journey through time,” said American Guild of Judaic Art President Shoshannah Brombacher, a New York painter who is one of the artists participating in the exhibit. The Atlanta artists in the exhibit are Barbara Ladin Fisher, Lynette Joel, Miriam Karp, Shoshanna Rosenthal and Flora Rosefsky (whose work is on the cover of the March 30 issue of the AJT). The other artists come from Tennessee, Kentucky, Virginia, Missouri, Massachusetts, Maryland, New York, Washington state, California, Ohio, Texas, Rhode Island and Pennsylvania, plus one from Ra’anana, Atlanta’s sister city in Israel. Many of the artists attended a presentation by New York fiber artist Laurie Wohl on “Textiles and Visual Midrash” on Wednesday, March 21. 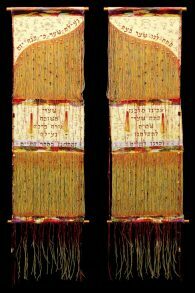 Wohl has a work in the show called “Ne’ilah,” composed of two large textile panels with prayers in calligraphy and a contrast between solid and unwoven threads. The Mainstreet Gallery is open throughout the operating hours of the Marcus JCC, 5342 Tilly Mill Road, Dunwoody: 6 a.m. to 10 p.m. Monday through Thursday, 6 a.m. to 6 p.m. Friday, 8 a.m. to 6 p.m. Saturday, and 8 a.m. to 8 p.m. Sunday. Admission is free. Visit www.atlantajcc.org for the hours during Passover.